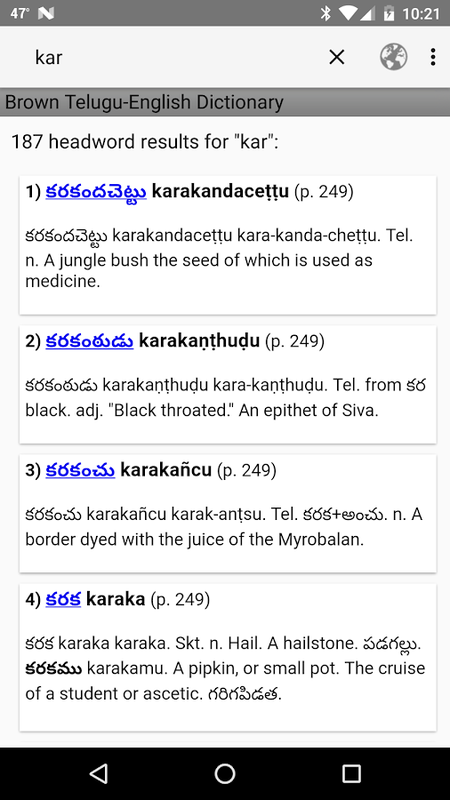 The Brown Telugu-English dictionary app is a fulltext searchableversion of Charles Philip Brown's "A Telugu-English dictionary,"new ed., thoroughly rev. and brought up to date ... 2nd ed. Madras:Promoting Christian Knowledge, 1903. It is a product of the DigitalSouth Asia Library program (http://dsal.uchicago.edu) at theUniversity of Chicago (http://www.uchicago.edu). 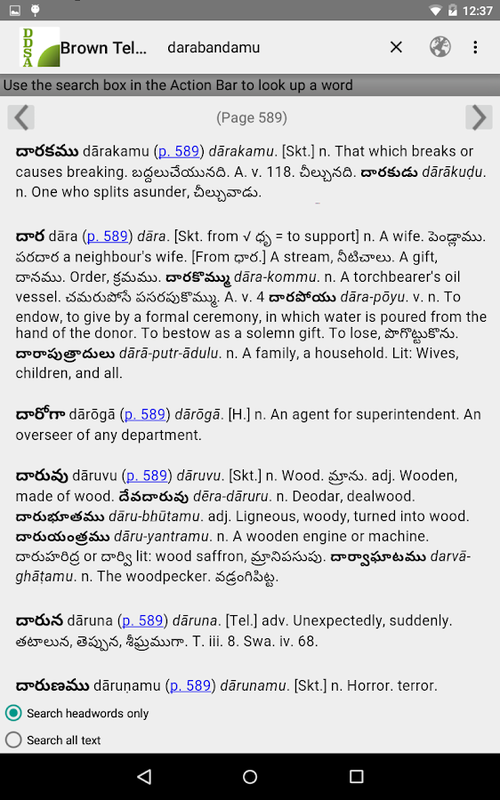 The BrownTelugu-English dictionary app can be used both online and offline.The online version interacts with a database that runs remotely ona server at the University of Chicago. The offline version uses adatabase that is created on the Android device upon first download.By default, the app operates in the online mode. *HeadwordSearching* The default mode for this app is to search headwords. 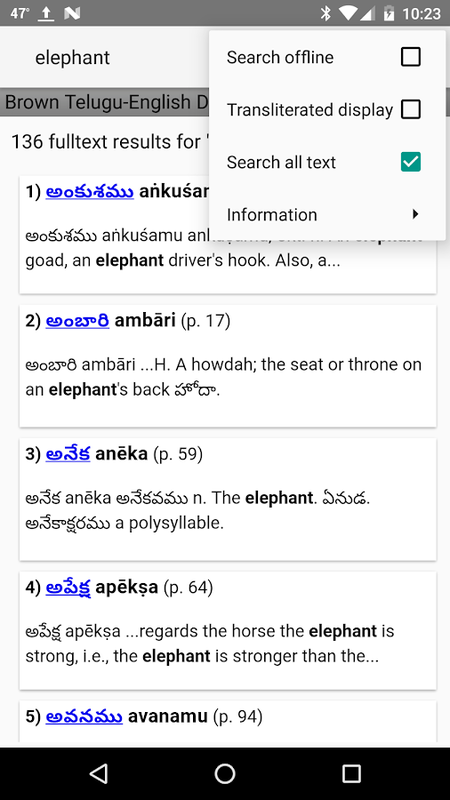 Tosearch for a headword, touch the search box at the top (magnifyingglass icon) to expose the on-screen keyboard and begin searching.Headwords can be entered in Telugu, accented latin characters, andunaccented latin characters. 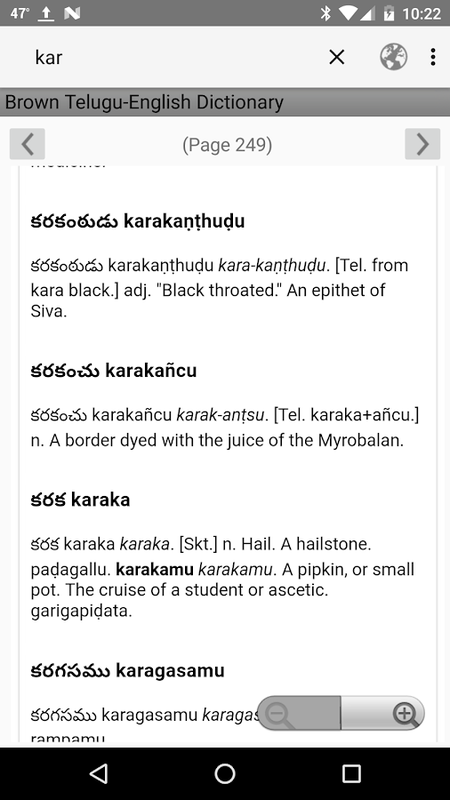 For example, headword searches forకరటి, "karaṭi," and "karati" all yield the definition "anelephant." *Fulltext Searching* For fulltext searching, select the"Search all text" check box in the overflow menu (usually the threevertical dots icon at the top right corner of the screen), thenenter the search term in the search box at the top. 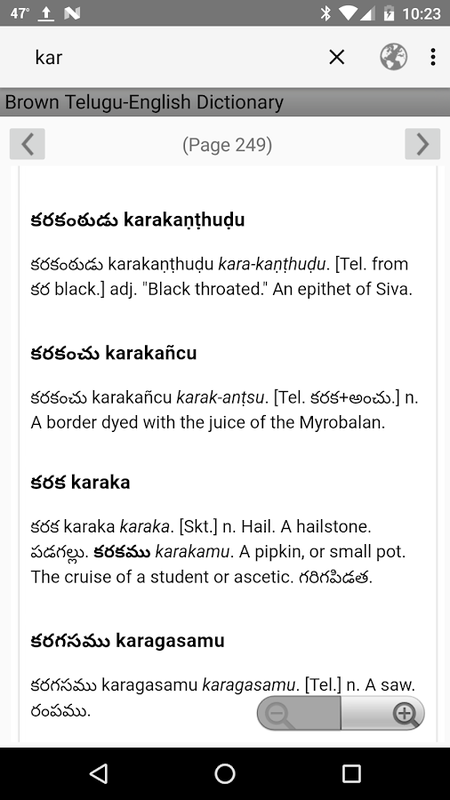 *ResultsDisplay* Search results come first in a numbered list that displaysthe Telugu headword, the accented latin transliteration of theheadword, and a chunk of the definition. To see a full definition,touch the list item. The full result page presents definitions in aformat that allows the user to select terms to copy and paste forfurther dictionary searching or for conducting a web search on theterm (given an internet connection). In online mode, the fullresult page also has a page number link that the user can click toget the full page context of the definition. Link arrows at the topof the full page allow the user to click to previous and next pagesin the dictionary. The user can also choose to see resultsdefinitions fully transliterated. In the overflow menu (threevertical dots icon at the top right corner of the screen), simplytouch "Transliterated display." *Selecting Online/Offline Mode* Toselect either online or offline mode, simply check or uncheck the"Search offline" box in the overflow menu. When in online mode, theworld icon at the top of the screen will appear dark; in offlinemode, it will appear light. Note that on start up, the app willtest to see whether the device has an internet connection and theremote server is available. Again, the app operates in online modeby default. The user should select the appropriate mode beforeconducting a search. The Fabricius Tamil and English dictionary app is a fulltextsearchable version of "J. P. Fabricius's Tamil and Englishdictionary" (4th ed., rev. and enl. Tranquebar: EvangelicalLutheran Mission Pub. House, 1972). It is a product of the DigitalSouth Asia Library program (http://dsal.uchicago.edu) at theUniversity of Chicago (http://www.uchicago.edu). The FabriciusTamil and English dictionary can be used both online and offline.The online version interacts with a database that runs remotely ona server at the University of Chicago. The offline version uses adatabase that is created on the Android device upon first download.By default, the app operates in the online mode. Fabricius Tamiland English allows users to conduct both headword and fulltextqueries. *Using the Fabricius Tamil and English dictionary**Headword Searching* The default mode for this app is to searchheadwords. To search for a headword, touch the search box at thetop (magnifying glass icon) to expose the on-screen keyboard andbegin searching. Headwords can be entered in Tamil, accented latincharacters, and unaccented latin characters. For example, headwordsearches for உபாகமம், upākamam, or upakamam will all yield adefinition about "a class of books secondary to the Agamas." Afterentering three characters in the search box, a scrollable list ofsearch suggestions will pop up. Touch the word to search for and itwill automatically fill in the search field. Or ignore suggestionsand enter the search term completely. To execute the search, touchthe return button on the keyboard. *Fulltext Searching* Forfulltext searching, select the "Search all text" check box in theoverflow menu (usually the three vertical dots icon at the topright corner of the screen), then enter the search term in thesearch box at the top. Fulltext searching supports multiwordsearching. For example, the search "corn rice" returns 11 resultswhere "corn" and "rice" can be found in the same definition.Multiword searches can be executed with the boolean operators "NOT"and "OR" as well. The search "corn OR rice" returns 321 fulltextresults; "corn NOT rice" returns 88 fulltext results. *ResultsDisplay* Search results come first in a numbered list that displaysthe Tamil headword, the accented latin transliteration of theheadword, and a chunk of the definition. To see a full definition,touch the headword link. The full result page presents definitionsin a format that allows the user to select terms to copy and pastefor further dictionary searching or for conducting a web search onthe term (given an internet connection). In online mode, the fullresult page also has a page number link that the user can click toget the full page context of the definition. Link arrows at the topof the full page allow the user to click to previous and next pagesin the dictionary. The user can also choose to see resultsdefinitions fully transliterated. In the overflow menu (threevertical dots icon at the top right corner of the screen), simplytouch "Transliterated display." *Selecting Online/Offline Mode* Toselect either online or offline mode, simply check or uncheck the"Search offline" box in the overflow menu. When in online mode, theworld icon at the top of the screen will appear dark; in offlinemode, it will appear light. Note that on start up, the app willtest to see whether the device has an internet connection and theremote server is available. Again, the app operates in online modeby default. The user should select the appropriate mode beforeconducting a search. The Old Marathi Dictionary app is a product of the Digital SouthAsia Library program (http://dsal.uchicago.edu) at the Universityof Chicago (http://www.uchicago.edu). The app offers a fulltextsearchable version of S. G. Tulpule's and Anne Feldhaus's "Adictionary of Old Marathi," Mumbai: Popular Prakashan, 1999.The OldMarathi Dictionary app can be used both online and offline. Theonlineversion interacts with a database that runs remotely on aserver at the University of Chicago. The offline version uses adatabase that is created on the Android device upon firstdownload.By default, the app operates in the online mode. The OldMarathi Dictionary app allows users to conduct both headword andfulltext queries. *Using the Old Marathi Dictionary app**HeadwordSearching*The default mode for this app is to search headwords. Tosearch for a headword,touch the search box at the top (magnifyingglass icon) to expose the on-screen keyboard and begin searching.Headwords can be entered in Devanagari, accented latin characters,and unaccented latin characters. For example, headword searches forअमृतवेळ, amṛtaveḷa, or amrtavela will all yield the definition "anauspicious time. "After entering three characters in the search box,a scrollable list of search suggestions will pop up. Touch the wordto search for and it will automatically fill in the search field.Or ignore suggestions and enter the search term completely. Toexecute the search, touch the return button on thekeyboard. *Fulltext Searching*For fulltext searching, select the"Search all text" check box in the overflow menu (usually the threevertical dots icon at the top right corner of the screen), thenenter the search term in the search box at the top. *ResultsDisplay*Search results come first in a numbered list that displaysthe Marathi headword, the accented latin transliteration of theheadword, and a chunk of the definition. To see a full definition,touch the headword link.The full result page presents definitionsin a format that allows the user to select terms to copy and pastefor further dictionary searching or for conducting a web search onthe term (given an internet connection). In online mode, the fullresult page also has a page number link that the user can touch toget the full page context of the definition. Link arrows at the topof the full page allow the user to go to previous and next pages inthe dictionary. *About "A dictionary of Old Marathi"*This is adictionary of the Marathi language in the Old Marathi period. It ismeant to be used in conjunction with a dictionary of modern Marathior by speakers of modern Marathi. Words occurring in the same formand with the same meanings in Old Marathi and modern Marathi havegenerally not been included in this dictionary. For Old Marathiwords not found here, the reader is advised to consult Molesworth'sMarathi-English dictionary or another dictionary of modern Marathi.Chronologically Marathi can be divided into three periods: OldMarathi, Middle Marathi, and modern Marathi. The earliest stage,Old Marathi, began in the eighth century and continued until themiddle of the fourteenth century.This is a dictionary of theMarathi language in the Old Marathi period. The Marathi of thistime is to a great extent homogeneous in form, and it is fairlyclearly distinguishable from the Prakrit and Apabhraṃśa languagesthat preceded it as well as from the subsequent Middle Marathi (c.1350-1800). Intended for use both by scholars and by nativespeakers of modern Marathi who wish to read Old Marathi texts, thedictionary gives meanings in both English and Marathi andprovidesillustrative citations of the meanings of the words. It is our hopethat, besides helping to make Old Marathi literature accessible,this dictionary can also provide a basis for dictionaries ofsubsequent periods of the language, and eventually for anhistorical dictionary of Marathi. Molesworth's Marathi and English dictionary app is a fulltextsearchable version of J.T. Molesworth's "A dictionary, Marathi andEnglish." 2d ed., rev. and enl. Bombay: Printed for government atthe Bombay Education Society's press, 1857. It is a product of theDigital South Asia Library program (http://dsal.uchicago.edu) atthe University of Chicago (http://www.uchicago.edu). Molesworth'sMarathi and English dictionary app can be used both online andoffline. The online version interacts with a database that runsremotely on a server at the University of Chicago. The offlineversion uses a database that is created on the Android device uponfirst download. By default, the app operates in the online mode. *Headword Searching* The default mode for this app is to searchheadwords. To search for a headword, touch the search box at thetop (magnifying glass icon) to expose the on-screen keyboard andbegin searching. Headwords can be entered in Devanagari, accentedlatin characters, and unaccented latin characters. For example,headword searches for अमृतवेळ, amṛtaveḷa, or amrtavela will allyield a definition about "halcyon hours." *Fulltext Searching* Forfulltext searching, select the "Search all text" check box in theoverflow menu (usually the three vertical dots icon at the topright corner of the screen), then enter the search term in thesearch box at the top. *Results Display* Search results come firstin a numbered list that displays the Marathi headword, the accentedlatin transliteration of the headword, and a chunk of thedefinition. To see a full definition, touch the list item. The fullresult page presents definitions in a format that allows the userto select terms to copy and paste for further dictionary searchingor for conducting a web search on the term (given an internetconnection). In online mode, the full result page also has a pagenumber link that the user can click to get the full page context ofthe definition. Link arrows at the top of the full page allow theuser to click to previous and next pages in the dictionary. Theuser can also choose to see results definitions fullytransliterated. In the overflow menu (three vertical dots icon atthe top right corner of the screen), simply touch "Transliterateddisplay." *Selecting Online/Offline Mode* To select either onlineor offline mode, simply check or uncheck the "Search offline" boxin the overflow menu. When in online mode, the world icon at thetop of the screen will appear dark; in offline mode, it will appearlight. Note that on start up, the app will test to see whether thedevice has an internet connection and the remote server isavailable. Again, the app operates in online mode by default. Theuser should select the appropriate mode before conducting a search. The Schmidt Modern Nepali Dictionary app is a fulltext searchableversion of Schmidt, Ruth Laila, "A Practical dictionary of modernNepali," [S.l. ]: Ratna Sagar, 1993. 1994. It is a product of theDigital South Asia Library program (http://dsal.uchicago.edu) atthe University of Chicago (http://www.uchicago.edu). The SchmidtModern Nepali Dictionary app can be used both online and offline.The online version interacts with a database that runs remotely ona server at the University of Chicago. The offline version uses adatabase that is created on the Android device upon first download.By default, the app operates in the online mode. *HeadwordSearching* The default mode for this app is to search headwords. 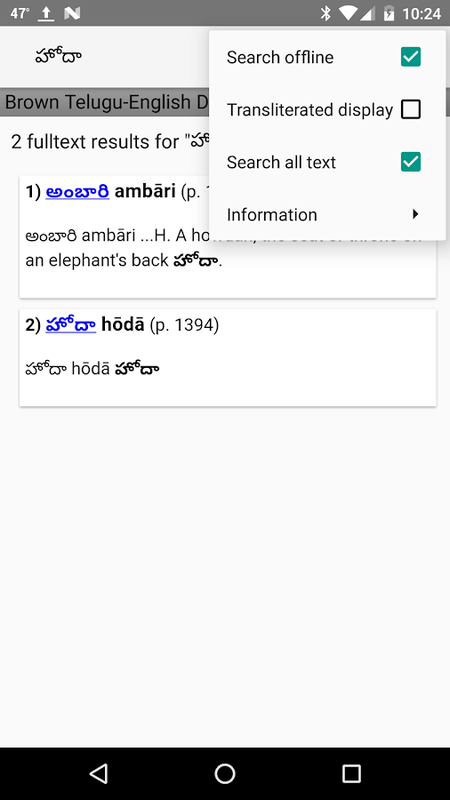 Tosearch for a headword, touch the search box at the top (magnifyingglass icon) to expose the on-screen keyboard and begin searching.Headwords can be entered in Devangari, accented latin characters,and unaccented latin characters. For example, headword searches forराम्रो, "rāmrō," and "ramro" all yield the definition "beautiful,attractive." *Fulltext Searching* For fulltext searching, selectthe "Search all text" check box in the overflow menu (usually thethree vertical dots icon at the top right corner of the screen),then enter the search term in the search box at the top. *ResultsDisplay* Search results come first in a numbered list that displaysthe Nepali headword, the accented latin transliteration of theheadword, and a chunk of the definition. To see a full definition,touch the list item. The full result page presents definitions in aformat that allows the user to select terms to copy and paste forfurther dictionary searching or for conducting a web search on theterm (given an internet connection). In online mode, the fullresult page also has a page number link that the user can click toget the full page context of the definition. Link arrows at the topof the full page allow the user to click to previous and next pagesin the dictionary. The user can also choose to see resultsdefinitions fully transliterated. In the overflow menu (threevertical dots icon at the top right corner of the screen), simplytouch "Transliterated display." *Selecting Online/Offline Mode* Toselect either online or offline mode, simply check or uncheck the"Search offline" box in the overflow menu. When in online mode, theworld icon at the top of the screen will appear dark; in offlinemode, it will appear light. Note that on start up, the app willtest to see whether the device has an internet connection and theremote server is available. Again, the app operates in online modeby default. The user should select the appropriate mode beforeconducting a search. The Berntsen Marathi-English Dictionary app is a product of theDigital South Asia Library program (http://dsal.uchicago.edu) atthe University of Chicago (http://www.uchicago.edu). The app offersa searchable version of Maxine Berntsen's "A Basic Marathi-EnglishDictionary," South Asia Regional Studies, University ofPennsylvania, 1975. The Berntsen Marathi-English Dictionary can beused both online and offline. The online version interacts with adatabase that runs remotely on a server at the University ofChicago. The offline version uses a database that is created on theAndroid device upon first download. By default, the app operates inthe online mode. Berntsen Marathi-English Dictionary allows usersto conduct both headword and fulltext queries. *Using the BerntsenMarathi-English Dictionary. * *Headword Searching* The default modefor this app is to search headwords. To search for a headword,touch the search box at the top (magnifying glass icon) to exposethe on-screen keyboard and begin searching. Headwords can beentered in Devanagari, accented latin characters, and unaccentedlatin characters. For example, headword searches for बकाणा,"bakāṇā," and "bakana" will all yield the definition "largemouthful." After entering three characters in the search box, ascrollable list of search suggestions will pop up. Touch the wordto search for and it will automatically fill in the search field.Or ignore suggestions and enter the search term completely. Toexecute the search, touch the return button on the keyboard. *Fulltext Searching* For fulltext searching, select the "Search alltext" check box in the overflow menu (usually the three verticaldots icon at the top right corner of the screen), then enter thesearch term in the search box at the top. *Results Display* Searchresults come first in a numbered list that displays the Marathiheadword, the accented latin transliteration of the headword, and achunk of the definition. To see a full definition, touch theheadword link. The full result page presents definitions in aformat that allows the user to select terms to copy and paste forfurther dictionary searching or for conducting a web search on theterm (given an internet connection). In online mode, the fullresult page also has a page number link that the user can touch toget the full page context of the definition. Link arrows at the topof the full page allow the user to go to previous and next pages inthe dictionary. The user can also choose to see results definitionsfully transliterated. In the overflow menu (three vertical dotsicon at the top right corner of the screen), simply touch"Transliterated display." The McAlpin Core Vocabulary for Tamil app is a fulltext searchableversion of David W. McAlpin's "A core vocabulary for Tamil," rev.ed. Philadelphia, Pa.: Dept. of South Asia Regional Studies,University of Pennsylvania, 1981. It is a product of the DigitalSouth Asia Library program (http://dsal.uchicago.edu) at theUniversity of Chicago (http://www.uchicago.edu). The McAlpin Tamildictionary app can be used both online and offline. The onlineversion interacts with a database that runs remotely on a server atthe University of Chicago. The offline version uses a database thatis created on the Android device upon first download. By default,the app operates in the online mode. *Headword Searching* Thedefault mode for this app is to search headwords. To search for aheadword, touch the search box at the top (magnifying glass icon)to expose the on-screen keyboard and begin searching. Headwords canbe entered in Tamil, accented latin characters, and unaccentedlatin characters. For example, headword searches for கடமை, kaṭamai,or katamai will all yield the definition "duty." *FulltextSearching* For fulltext searching, select the "Search all text"check box in the overflow menu (usually the three vertical dotsicon at the top right corner of the screen), then enter the searchterm in the search box at the top. 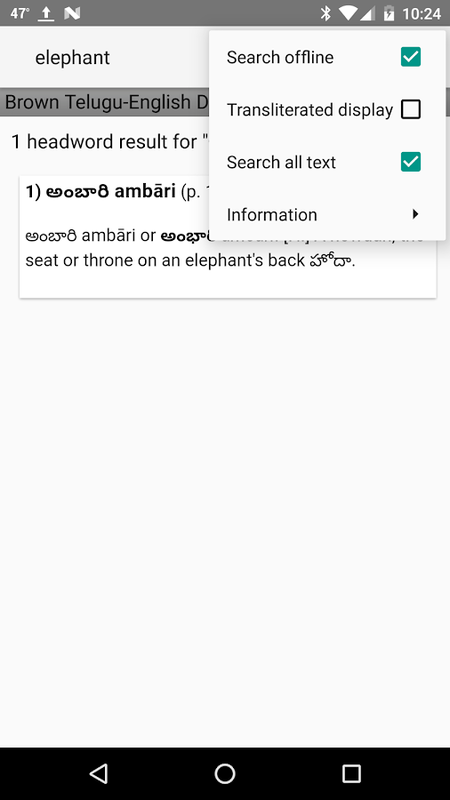 *Results Display* Search resultscome first in a numbered list that displays the Tamil headword, theaccented latin transliteration of the headword, and a chunk of thedefinition. To see a full definition, touch the list item. The fullresult page presents definitions in a format that allows the userto select terms to copy and paste for further dictionary searchingor for conducting a web search on the term (given an internetconnection). In online mode, the full result page also has a pagenumber link that the user can click to get the full page context ofthe definition. Link arrows at the top of the full page allow theuser to click to previous and next pages in the dictionary. Theuser can also choose to see results definitions fullytransliterated. In the overflow menu (three vertical dots icon atthe top right corner of the screen), simply touch "Transliterateddisplay." *Selecting Online/Offline Mode* To select either onlineor offline mode, simply check or uncheck the "Search offline" boxin the overflow menu. When in online mode, the world icon at thetop of the screen will appear dark; in offline mode, it will appearlight. Note that on start up, the app will test to see whether thedevice has an internet connection and the remote server isavailable. Again, the app operates in online mode by default. Theuser should select the appropriate mode before conducting a search. The free Online Dictionary from PONS - with Text Translation Getquick and reliable translations - with 42 PONS Dictionaries andtext translation for 36 languages. This Online Translator gives youa translation for all of your search queries. The app includes PONSDictionaries for Arabic, Bulgarian, Chinese, Dutch, English,French, German, Greek, Italian, Latin, Polish, Portuguese, Russian,Slovenian, Spanish and Turkish. Each dictionary works in bothdirections. In addition to dictionaries with German you will finddictionaries for combinations such as Spanish-English,French-Polish, or Portuguese-Spanish. You have access to a total of42 dictionaries. The text translation system integrated into theapp covers all of the languages of the online dictionaries plus anadditional 16 languages such as Hebrew or Japanese. INTELLIGENTSEARCH Type in or say your search term. To make your search quickerand more convenient, the system provides suggestions for words andphrases. If the app can‘t find a result in the PONS Dictionaries,the integrated text translation service kicks in to give you yourdesired result. COMMUNICATION AID Listen to the correctpronunciation of your dictionary translation. Use the zoom functionto magnify the translation and show it to someone else on yourdevice. Especially handy on trips! CONVENIENT REFERENCE Save yourfrequently searched or important entries in your favourites - youcan use these offline, too. In your search history you can findyour most recent searches. With the copy and paste function you canuse your translations in other applications. New in the app:reverse translation back into the source language. EXAMPLESENTENCES Language in context and information on language usagehelp you to find the correct translation. AN IDEAL COMPLEMENT Copyyour translations to the free PONS Vocabulary Trainer so that youcan learn them. EDITORIALLY REVIEWED QUALITY Our dictionary contentis editorially reviewed by our lexicographers and constantlygrowing. We provide an option for ad-free subscriptions on amonthly or yearly basis. PLEASE NOTE: if you don’t have asubscription you can still enjoy full use of our app completelyfree of charge. Visit our website at www.pons.com for moreinformation about the free Online-Dictionary, the PONS VocabularyTrainer and our apps. Are you studying English or Urdu and you want to know the meaningin real Urdu or English font with Roman Translation? Thenapplication (English to Urdu Dictionary) is best for you. OfflineUrdu English Roman Dictionary is a dictionary learning applicationfor all users who want to learn English Language. Free English toUrdu Dictionary can be used for learning English to Urdutranslation and pronunciation. The App (English to Urdu dictionary)giving meanings from Urdu to English and Roman to English or Urdubut the Urdu and English Dictionary app also gives the commonfunctionality of English to Urdu words meanings. Therefore, thosewho want to find the meanings in conventional way can find Urdumeanings of English words in this dictionary just like an Englishdictionary. 100% free dictionary app contain the features ofEnglish Dictionary Offline and Urdu Dictionary Offline. It hasembedded Urdu font which doesn't require any additional Urdufeature on your device. A complete Urdu to English dictionary isworking just like an Urdu to English trainer with Roman translationsupport. You also can say its Urdu Dictionary. English and UrduDictionary is not only an Urdu Dictionary offline but also alearning tool. You can use this English dictionary app when youhave no internet connection. There is auto suggestion so you neednot type full words. You also can use Speech to text feature. Youcan add words to the study plan and remove words from the studyplan. When you start typing, you will see some words starting withthe letters you typed. The Urdu dictionary app searches in adatabase for the matching words. Also, this App (English Urdudictionary) provide definitions, synonyms, antonyms and relatedwords, but mechanism is easy to understand the meanings. Best UrduEnglish dictionary is designed for those people who know about Urduand want to learn English language this is best Urdu to Englishdictionary with a large amount of words. If you are reading Englishbooks, view movies with subtitles or see any word anywhere and youwant to know his meaning then open the English to Urdu dictionary.Urdu English dictionary will provide you all the essential needs ofyour everyday language needs and make your needs easier,comfortable and funny. How to Use: 1- You can search any Englishword and then click on it to read its meanings in Urdu and romanlanguage. Meanings are displayed in real Urdu language and also inroman. 2- You can also search any Urdu word then click on it to getits meanings in English. 3- The App also contain feature English toRoman Dictionary, you can search any English or roman word and getits meaning in Roman, English and Urdu. Features of UrduDictionary: - Translations – English to Urdu, Urdu to English withRoman. - Layout - is very simple and is user friendly. - Favorites/ Bookmarks - you are able to add words to favorites list byclicking the star/heart icon. - Thesaurus – sorted list of allwords starting with alphabets in English, Roman and Urdu. - Test –app has a unique feature of MCQ (Multiple Choice Question) test tolearn more words - Notification – app will notify you with a worddaily to increase your vocabulary (Word of the Day) - Keyboard –both English and Urdu Keyboards are available - Multiple Options –words with their multiple meanings, definitions, synonyms, antonymsand related words - Word spelling, using Text-To-Speech module (NoInternet Connection required). - Maximum data is used - up-to-datevocabulary. - 300,000+ words and vocabulary is updated time to timeon the weekly basis. With its clear definitions and carefullychosen up-to-date vocabulary from all areas of life the Urdu -English - Urdu dictionary with roman translation will meet youreveryday language needs and will make your trips more comfortableand fun.It’s the best English Urdu dictionary free for travelers,business mans, players, students, children, teachers, learners,boys and girls. 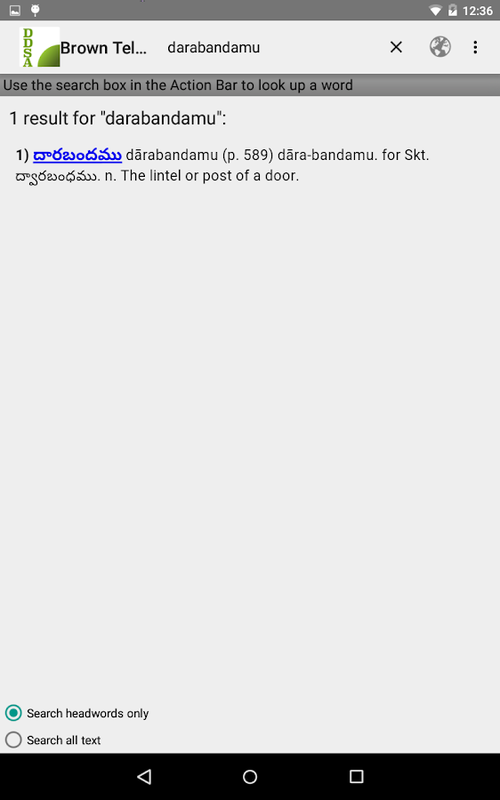 Bangla <> English Dictionary offline and free. You can searchboth English and Bangla words. You can search words directly from"Internet Browser" or other Applications by using Sharing option.In the sharing option you will find "Bangla Dictionary" andchoosing "Bangla Dictionary" will open the dictionary with theshared word so you need not type. Exiting from the dictionary willreturn you to "Internet Browser" or other Applications again. Thisis not only a Dictionary but also a learning tool. You can use thisdictionary when you have no Internet connection. MCQ (MultipleChoice Question) option is available. There is autosuggestion soyou need not type full words. You also can use Speech to textfeature. You can add words to the study plan and remove words fromthe study plan. When you start typing, you will see some wordsstarting with the letters you typed. The dictionary searches in adatabase for the matching words. This can slow down typing in smallhandsets. Therefore in settings there is an option to turn thatoff. So low profile mobile handsets can turn off Auto search totype quickly. You will see a Dictionary icon on the notificationbar to start the app quickly. On sharing text you will find theBangla Dictionary. This will be helpful to find out the meaning ofany word. Features of the Dictionary: • Bangla To English • EnglishTo Bangla • No internet connection required • Search From Web •Search by Sharing • Auto Suggestion • Pronounce & Voice Search• Antonyms (Opposite words) • Synonyms • Backup and Restore •History & Study Plan • Word Game • Share Words • Copy Words Ifthe Dictionary does not install on your device because of apk filesize, please install "Bangla Dictionary Lite" . If you wantdefinition in English and example in sentence, please install"Bangla Dictionary Heavy". The free offline English dictionary and thesaurus with synonyms,related words and great search - and no adverts. Audiopronunciations are available with the separate Audio Edition app.The comprehensive WordWeb dictionary database includes: - 285,000words, phrases and derived forms - 225,000 word sense definitions -70,000 usage examples - 85,000 text pronunciations - Synonyms,similar and related words - N. American, British, Australian andinternational English The intelligent word entry suggests possiblecorrect spellings as you type, as well as listing words that soundthe same or are often confused. Additional features include theability to drill down on any word in a definition, full bookmarksupport and history. Search features include: - Alphabeticallisting - Spelling suggestions - Sounds-like and often-confused -Fast pattern-matching search (*, ?, vowel and consonant) - Filtersearch results by noun, verb, adjective, adverbs The databaseincludes proper nouns and common abbreviations in addition toEnglish vocabulary (e.g. LOL, Oxford, JPEG, Webster, UNHCR, etc. 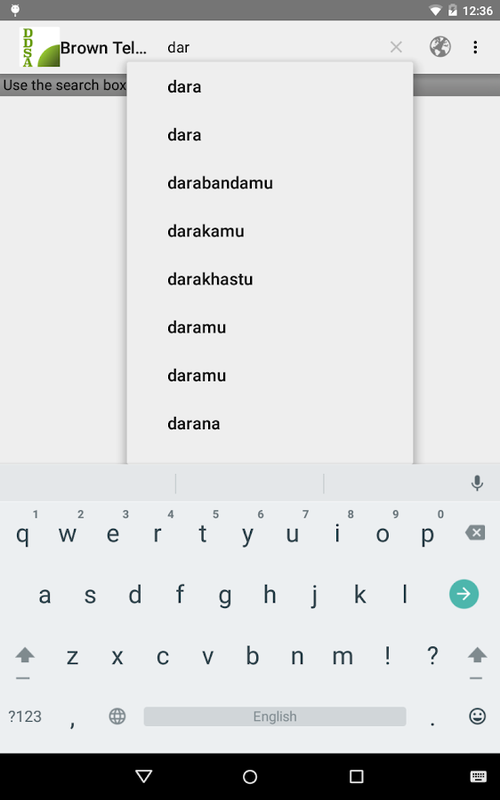 )You can quickly look up words from within other apps by selectingthe word, then selecting WordWeb from the pop-up menu (requiresAndroid M and higher). No Internet connection is required to useWordWeb, and it's free. Better than dictionary.com? - judge foryourself! Translate English to Hindi. Translate Hindi to English. No internetconnection required. Fast, convenient & easy to use. Very smartword suggestions. All dictionaries in one place. Just tap the wordto see its meanings. Translate text directly in the web browser andother apps. Text pronunciation. Picture dictionary. Word reminder.Plenty of dictionaries available to install. And a lot more usefulfeatures.